Chrysler AUX input adapters and aux cables for Chrysler 300C and Grand Tourer. Connect iPod, iPhone, iPad, MP3 players and more via RCA phono or 3.5mm jack lead. 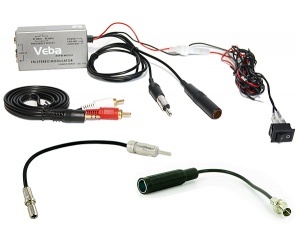 This Chrysler AUX adapter via Wired FM modulator is the easy way to connect an iPod, iPhone or any portable MP3 player to your Chrysler sound system. Supplied with Chrysler aerial adapters.